publish in Images on February 6th, 2008 by slakinator | Report This Post | Click to Add to favorites | Tags: Science! 1989. 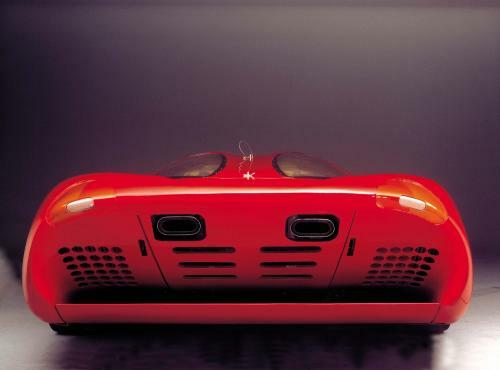 Rear view of the Colani Ferrari Lotec Testa d’Oro. Well, this is probably coming from someone who will never be able to afford either, but, my favorite car (that I could never afford) was the Ferrari F430 (what Will Smith drove in Bad Boys II, I think), but was then replaced by the Lamborghini Murcielago (thanks in part to the fact it was driven by Christian Bale in Batman Begins). So I have to say that they each have a model that I highly desire. Is this some kind of retribution for Tiki’s recent goat fixation? if it is, I must say that I approve! @schulz: Yeah, the recent LP640 is an incredible beast allright. Heck, even their designs from the 90’s still make me wet my pants. Tho, I hear these cars have a horrible exhaust note, supposedly loud enough to damage your hearing at close range. Wait, how is that horrible? Sounds more like “heavenly” to me.